The Edwardian Teddy Boy - London RnR Appreciation Soc. 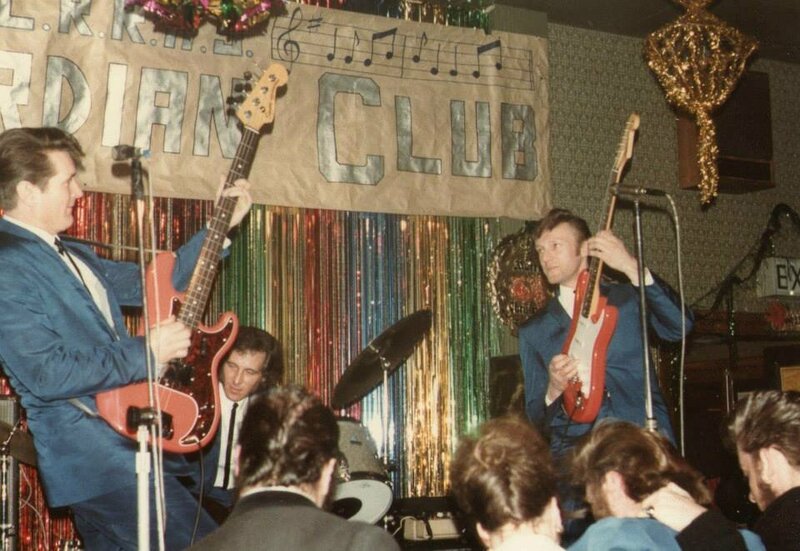 The London Rock 'n' Roll Appreciation Society was run from 1983 until 1993 at The Selbourne Banqueting Suite, at the rear of The Cherry Tree Pub, Southgate, London N14. Here are some photographs of the Club during it's existence. 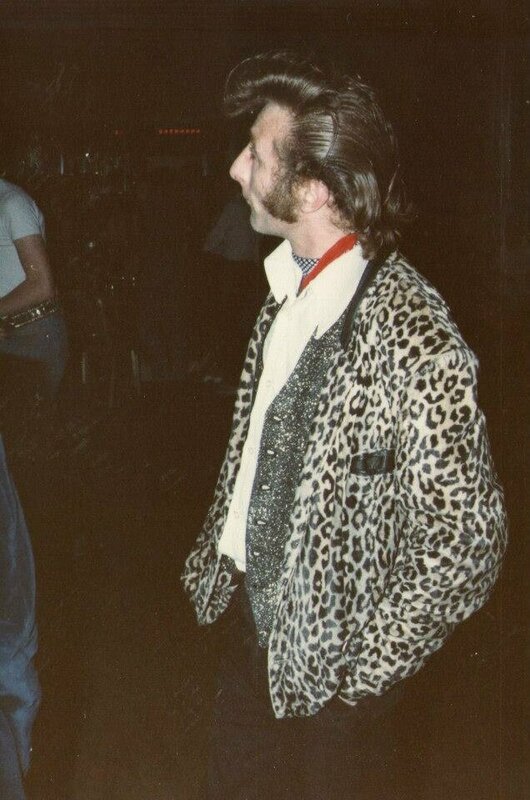 The London Rock 'n' Roll Appreciation Society was run by Jerry Vincent from 1983 until 1993, who also ran the Edwardian Club with partner Mick Hill. It opened in 1983 at The Selbourne Banqueting Suite, The Olde Cherry Tree, Southgate, London N14. The London Rock 'n' Roll Appreciation Society also produced it's own magazine "Rock Around The Town" that included the "Where to Rock 'n' Roll Gig Guide" first started by Chess Ferrier some time earlier. The Edwardian Club ran for approx 2 years before rebranding as The London Rock 'n' Roll Club under the sole control of Jerry Vincent which continued until 1988. Several other venues were also run by The LRRAS including The Pied Bull, Islington, St. Johns Tavern, Archway, The Fox (Rock-it club) Palmers Green, Hackney Hospital RnR Club, Hommerton, The Camden Workers Club, Kentish Town and brief spells at Bumbles (1993), Limes Bar, Bethnal Green and The London RnR Show in a circus marquee on Streatham Common in conjunction with Peter Linguard of the Towers Pub fame. Regular members of the London Rock 'n' Roll Appreciation Society photographed at The London Rock 'n' Roll Club, Southgate, North London in 1986 featured in the HMV booklet 'British Youth Culture'. 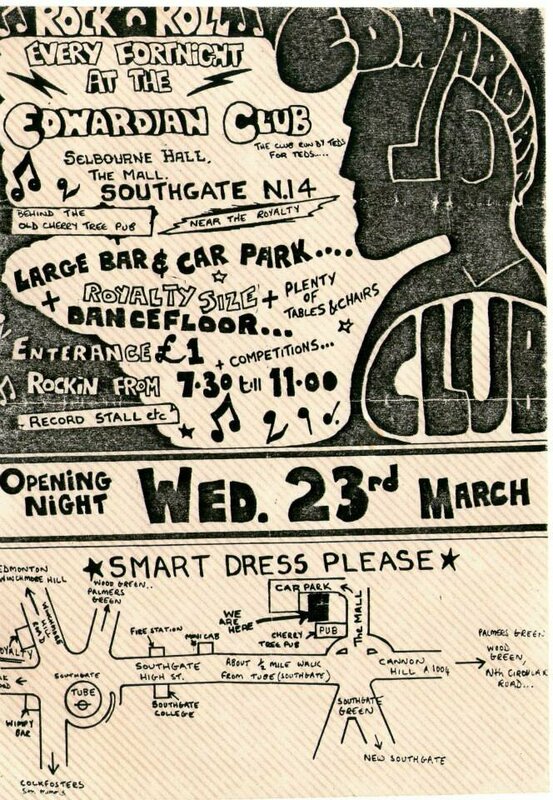 Poster advertising the opening of the Edwardian Club, Southgate, N. London on Wednesday 23rd March 1983. The Rapiers perform on December 14th 1983 at the Edwardian Club. Teddy Boy, Johnny Mason watching the Rapiers 1983.